Alexander Wang: Ba rcodes are back this season for Alexander Wang who presented his Spring/Summer 2015 collection for the Mercedes Benz New York Fashion Week event. After the huge explosion of online blog posts drooling over his barcode embellished tees for the Resort 2015 collection, it seemed only appropriate that Wang should revive the concept by sticking a few of those coded lines on the front of two of his Spring looks. Several of the garments also got a smaller scannable codes placed strategically at the neckline giving a ready-to-buy affect. However, the biggest influence of the day was most definitely the athletic sneaker. Literal sportswear has surprisingly received a recent revival in many collections (in the Spring collections of Chanel and Dior most notably) and Wang is the perfect spokesperson for its cause in the haute couture world. Several of the swishy tennis dresses had mesh-like fronts that were representative of these shoes sleek breathable designs, with one design even having literal “shoelaces” tying up the top of the dress. The sports sneaker’s influence didn’t stop there though as was reflected in the sporty design of Wang’s diverse collection of handbags for the show. The show closed out with several geometric printed tops and Wang running down the runway waving to his avid fans and smiling all the while at another job well done. 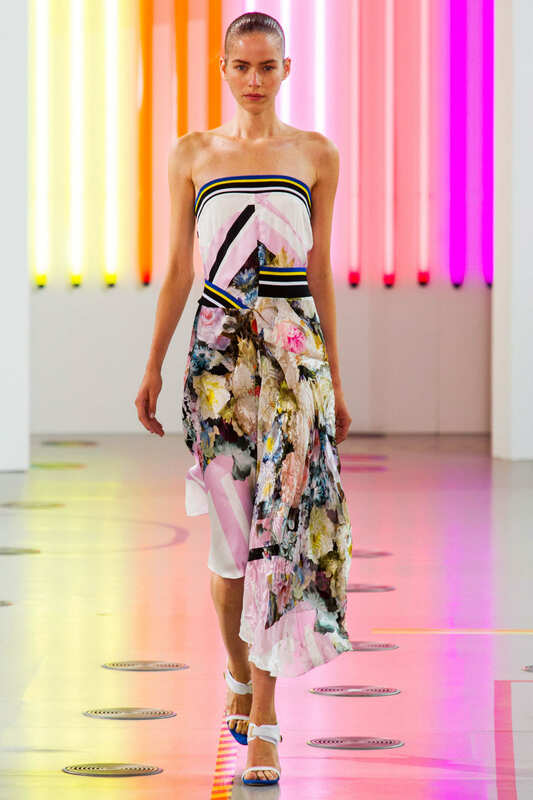 Preen by Thornton Bregazzi: Justin Thornton and Thea Bregazzi’s Preen Spring Ready-to-Wear collection for 2014 was arguably one of their most visually memorable and most beloved collections to date. Luckily, this power couple have tapped into that creative vein again and have incorporated several of those winning elements into their Spring/Summer collection for 2015. The visual asymmetry and lightness of both fabric and mood that Preen is known for was out in full force for the Spring. Long flowing striped dresses in blues, reds, and whites seemed to dominate the first part of the show, with varying floral prints overlaid and dispersed throughout. Some of the looks even managed to look almost like tailored business suits, especially in regards to the first three designs. The asymmetrical floral patterned dresses in the middle of the show really harkened back to that beloved 2014 runway in terms of print and design. Zippered sportswear inspired overcoats and active-wear followed with an enviable oversized sweater thrown in to remind us that it has not even reached winter yet. With fashion’s obsession with putting out an ever increasingly fast pace of new (and out of the current season) collections, this nod to the current season seemed appropriately old-fashioned. The show was closed out by a showing of beautifully fringed mini-dresses that remind us that Spring is a time for fun and frolic (even if that time is far off). Temperly London: Apparentl y the obsession with the sheer trend has given it a lot of staying power. Therefore, the challenge for many designers is how to incorporate it into their collections in new and exciting ways. Luckily, Temperly London, through perseverance and sheer innovation has worked the concept really well in their recent Spring/Summer 2015 show for London Fashion Week. By cutting out geometric designs in the sheer fabrics that she used to add an element of flowiness to her garments, Temperly gave fans a new twist on their treasured trend. Long silk robes juxtaposed under tailored jackets gave an ethereal quality to the runway show, and made the clothes look effortless. Sheerness didn’t stop there though, as seen in the completely see-through dresses that were patterned with looping vines (or maybe ventricles) that whispered across the stage. Tartan and paisley patterns were also given a new form with the mixed colors of tartan composing several skirts, and the traditional red paisley print being used as cut-outs for sheer panels on a couple of the later looks. The overarching theme of innovation really elevated what could have been only simple designs into something of sheer brilliance.